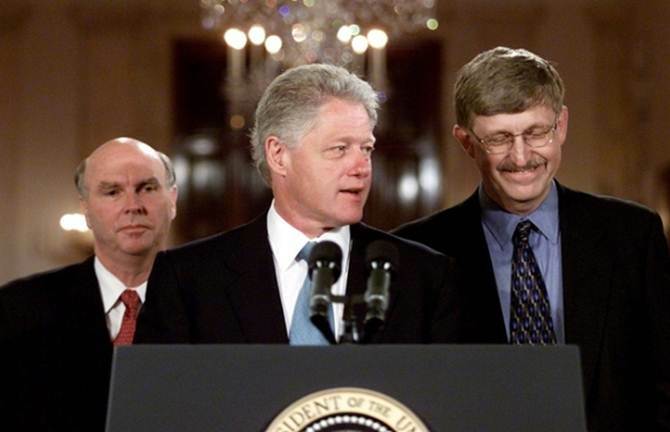 Francis Collins, M.D., Ph.D., now director of the NIH, stands to the right of then-President Bill Clinton (J. Craig Ventner, Ph.D., left) at the announcement that an international consortuim had completed the first "working draft" of the human genome on June 26, 2000. Three years later, Dr. Collins and others would announce the completion of the Human Genome Project. The White House, at that time, characterized the scientific achievement as akin to splitting the atom and landing on the moon. This week marks the 10th anniversary of the completion of the Human Genome Project, a roughly 10-year, $3-billion, international effort to determine all 6 billion letters (3 billion base pairs) of human DNA. It was a major scientific achievement funded by the National Institutes of Health, Department of Energy, several international governments, private capital, dozens of academic and research medical centers, and it included participation and collaboration from thousands of public and private scientists around the world. In a recent Q&A with the New York Times, Dr. Eric Green, M.D., Ph.D, director of the NIH's National Human Genome Research Institute, discusses just how far we've come -- It's a really long way. And what he sees for the application of this work -- which Dr. Green plans to share here at Mayo Clinic as the keynote speaker at the Individualizing Medicine 2013 Conference. The first human genome bluebrint consisted of bits of DNA from several blood donors interested in scientific advancement. It showed the world that it could be done, and the work signified the starting of a race to reshape the ways to diagnose, treat and prevent disease in the individual patient. Dr. Green will be the keynote speaker at Individualizing Medicine 2013: From Promise to Practice. This conference focuses on how to translate the promise of genomic medicine to your practice. Expert speakers, focused breakout sessions, case studies, and a poster session provide opportunities to discover and discuss emerging topics in applied genomics. Category 1 CME is available. Here we are, 13 years later, and 10 years after the Human Genome Project was complete. Here's what Dr. Green told the NY Times, when asked about the naysayers who have been critical of a perceived lack of progress. "I don’t hear that as much anymore. I think what’s happening, and it has happened in the last three years in particular, is just the sheer aggregate number of the success stories. The drumbeat of these successes is finally winning people over." Now, we're taking these technologies into patient care with programs like the Individualized Medicine Clinic, which brings genomics into care of patients with advanced cancers and difficult diagnoses. Gianrico Farrugia, M.D., director of the Center for Individualized Medicine at Mayo Clinic, is available for interviews and commentary. Please email Sam Smith or call 507-284-5005 (days), 507-284-2511 (evenings) to schedule.